Common burdock (Arctium minus) (also knows as burweed) is one of two species of plants in the genus Arctium native to Europe that have been introduced into North America; and have spread across the continent over the last three centuries. It holds many roles in the contemporary world of North America: invasive weed, permaculture plant, medicine, and food. Like so many plants that have found their way to new lands as human populations have expanded and relocated, burweed is seen as a boon, or a burden. Common burdock is a biennial plant in the family Asteraceae. Flowers: The flowering heads are composed of disc florets (no ray florets) sub-tended by 9-17 overlapping, adpressed rows of phyllaries that end in an inward pointing hooked tip that make up the involucre of the flower head. The disc florets are composed of a thin, bristly pappus subtending a light pink five petaled corolla, and a fused tube of purple anthers with white filaments and a bifurcated stigma emerging from the fused anther tube. The flowering heads are fairly tightly packed on short pedicels arising from the leaf axils. Leaves: During the first year it sends out a basal rosette of large ovate leaves with cordate bases and acute tips. The margins are coarsely toothed and sinuate with a tiny projection extending off of each lobe. The leaves have relatively long hollow petioles. The petioles are hollow, grooved and lightly purple at the base (especially on the dorsal side). The base of the stalk is prominently furrowed dorsally. The leaf blades themselves are dark green dorsally and sparsely pubescent while the ventral leaf blades are lighter green with denser lanate hairs. The venation of the leaves is pinnate with obvious lateral and sub-lateral veins and a prominent mid-vein. During the second year it sends up a flowering stalk with alternate cauline leaves that are smaller, but with a similar morphology to the first-year basal leaves. Root System: Burweed is tap-rooted with lateral rootlets branching off from the main taproot. Common burdock is a biennial forb (although sometimes the growth cycle can take 3-4 years when competition from other plants is significant) that grows best in fertile soils that have undergone an initial disturbance, but that do not undergo subsequent disturbance. It produces up to 15 thousand seeds per plant with a 90% viability rate. The seeds will last in the soil from 1-3 years. It prefers full sun or partial shade. The hooked tips of the phyllaries that make up the involucre are an adaptation for seed dispersal. Animals that pass by a mature seed head often pick up and disperse the seeds as the hooked tips grasp onto the animal's fur, and later fall off spreading the seed to new locations. Burweed often outcompetes smaller herbaceous plants in their vicinity by shading them out with their large leaves and spreading growth habit. 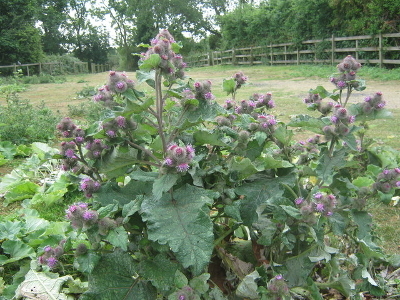 Common burdock is relatively easy to control due to its biennial nature. To control it simply till the soil before the flowering heads reach maturity to avoid spreading the seeds. The tilling destroys the taproot. It can be an issue for people engaged in animal husbandry (especially sheep) as the hooks on the phyllaries tangle into the hair of sheep and devalue the wool. Burweed has a several permaculture uses. One way to use in a permaculture system is to grow it as a mulch. The large leaves work well in a chop and drop mulching system. Another option is to grow dense patches as a hedge. 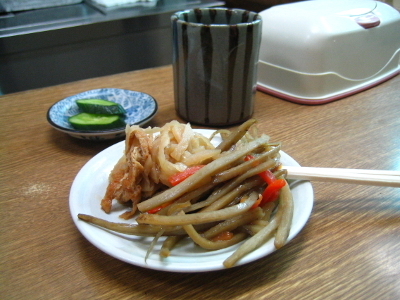 The tap root can be harvested and eaten during their first year of growth, with the harvest concentrated in the fall after the plant has begun concentrating nutrients into the root system. The flowering stalks can be peeled and eaten (all the rind must be removed) and the leaves are edible before flowering. The roots and seeds have been used throughout history as a blood purifier and in the treatment of skin diseases. In conclusion, common burdock has become a part of wild and domesticated plant communities across North America since its introduction as a food plant by European colonists. Burweed walks the fine line between its positive use as a food and medicine, and the difficulty it can cause for farmers. Whatever your feelings about the plant, it is a species that is worth getting to know. 1)	Bebeau, G. D. "The Friends of the Wild Flower Garden, Inc." Lesser (Common) Burdock, Great Burdock, Arctium minus Bernh., Arctium Lappa L. Friends of the Wildflower Garden, Inc., 2014. Web. 11 July 2016. 2)	Pojar, Jim, A. MacKinnon, and Paul B. Alaback. Plants of the Pacific Northwest Coast: Washington, Oregon, British Columbia & Alaska. Redmond, WA: Lone Pine Pub., 1994. Print. 3)	Wertz, Betsy Ann, and W. Thomas Lanini. 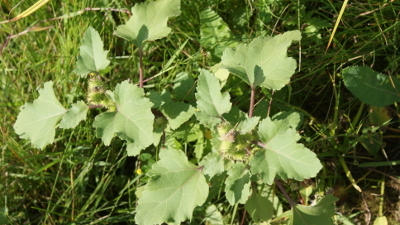 "Common Burdock (Weed Management)." Weed Management (Penn State Extension). Penn State University, 2016. Web. 11 July 2016. 4)	Alfrey, Paul. "Permaculture Magazine." Permaculture Magazine. Permaculture, 20 Apr. 2015. Web. 11 July 2016. 5)	Deur, Douglas. "Pacific Northwest Foraging: 120 Wild and Flavorful Edibles from Alaska Blueberries to Wild Hazelnuts." Portland, Or. : Timber, 2014. Print. 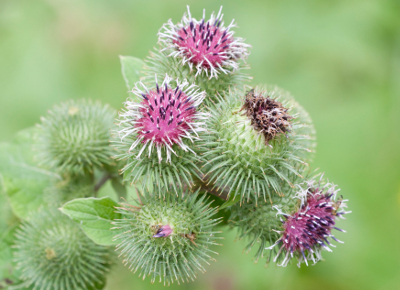 Learn more about burdock at the PFAF website. Learn more at our Wild Edible & Medicinal Plants Courses.